Unless you're obsessively organized, or love the iconic aesthetics of the old-school manual models, it's really hard to muster much excitement for a labelmaker. 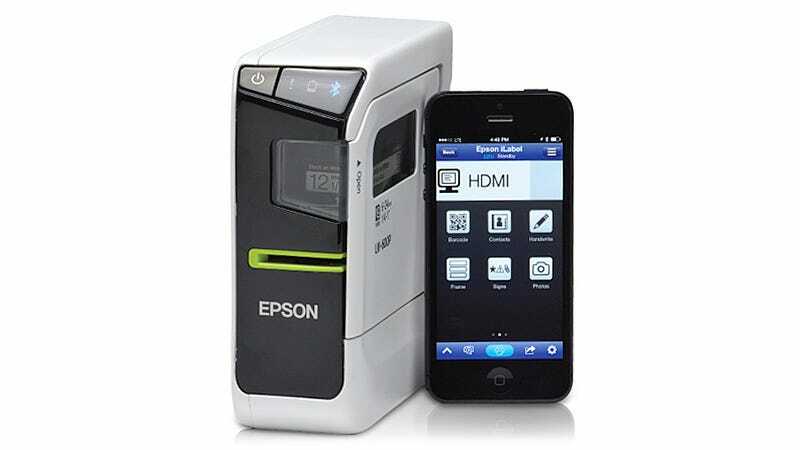 But somehow Epson has managed to create the perfect tiny printer for the smartphone age. For the casual user it's finally an easy way to bring a little bit of order into their lives, and for the obsessive labeller it's pretty much the equivalent of landing on the moon. The LabelWorks LW-600P looks like an external hard drive sitting on your desk, but it's actually a compact rechargeable thermal printer that can spit out labels up to an inch thick at a speed of just over half-an-inch per second. It can connect to a PC using a standard USB cable, but—and this is where things get really exciting—it can also wirelessly connect to an iOS or Android-based smartphone or tablet. Using an accompanying app mobile device users can see a preview of their label exactly as it will appear on the printed tape, and they can even write labels by hand using their finger on the touchscreen display. Preferred designs can be stored in the app for later re-use, and everything from emoticons, to symbols, to photographs can be imported—though the printed results will always be monochrome.